November 20, 2017, New Delhi: With internet becoming urban Indian’s favorite shopping destination nowadays, hundreds of thousands of consumers are now buying products from eCommerce sites every day. With these sites listing millions of products for sale, consumers reviews become very important of the buying process, as the buyer looks to check how the experience of other buyers has been with that particular product. Many consumers say that a lot of these reviews are fake or planted. 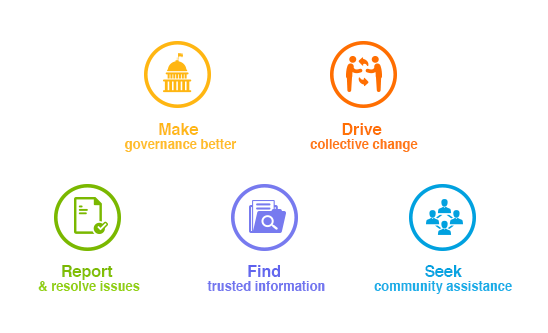 To find the collective consumer pulse on this issue, LocalCircles conducted a survey which received more than 18,000 responses. The first poll asked consumers if they have experienced significant variation between a product review on ecommerce site and the actual product received. Surprisingly, 62% consumers replied with a yes, while 27% replied with a no. 11% chose not to answer. Many consumers rely on reviews from other users to decide if the product is fit to be bought or not. Tampering with these reviews leading to a purchase, hence is nothing less than trying to cheating them. 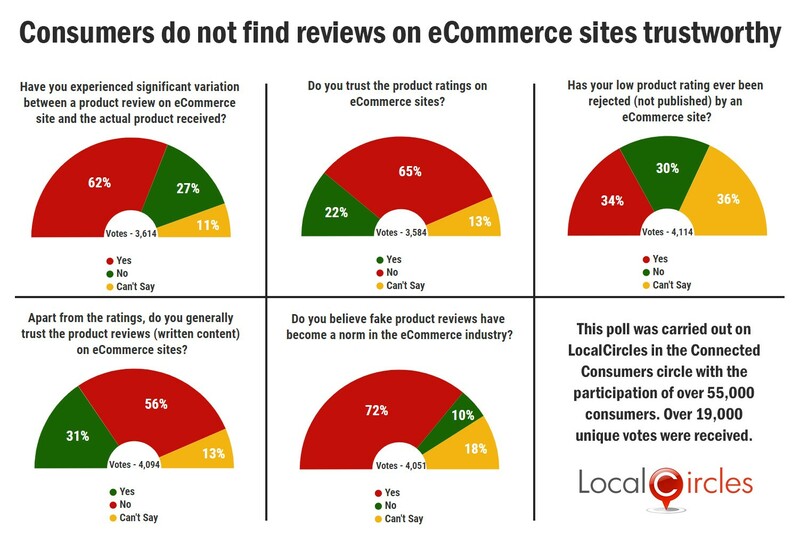 The second poll asked consumers if they trusted the product reviews on ecommerce sites. 56% responded in a negative while 31% responses were an affirmative. 13% were unsure about it. Some consumers in a structured discussion had earlier reported that many ecommerce sites do not publish a bad product review written by the consumer on their site to make sure that the product sales are not hampered. 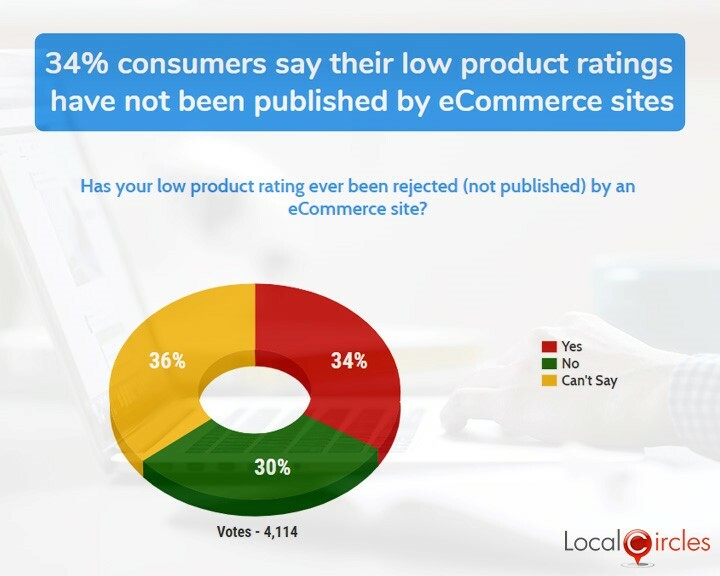 The third poll asked consumers if their low product rating had ever been rejected (not published) by an eCommerce site. 34% consumers said it has personally happened with them and 30% said it had not happened with them. 36% were not sure about it. 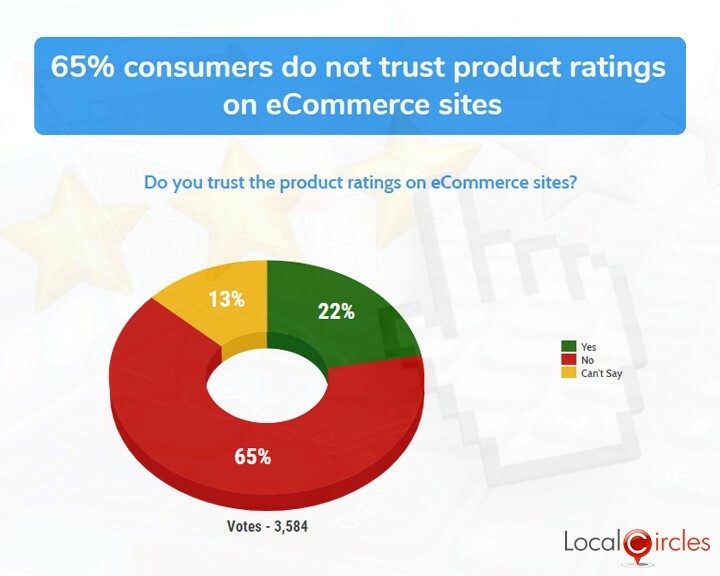 In the next poll, 65% consumers said they do not trust product ratings on eCommerce sites. Only 22% said they trust them and 13% chose not to answer the question. In the last poll, 72% consumers said that they believe fake product reviews have become a norm in the eCommerce industry. 10% said this was not the case and 18% were unsure about it. Consumers mentioned that many businesses are thriving on their ability to provide fake ‘good reviews’ to the prospect buyers and in most cases once a business lists a product, the seller himself as an individual goes and rates and reviews the product. It is also very common for them to ask family and friends to rate and review their product. Some sellers even go to the extent of making a purchase from their own business so as to getting a “verified purchase” rating and review for their product. 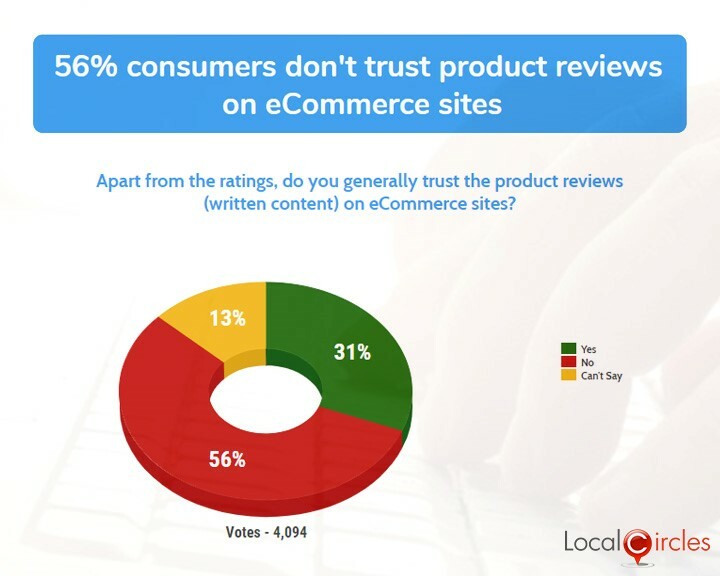 Consumers must take into account the number of ratings and reviews when buying on eCommerce sites, suggested some LocalCircles members. Consumers suggested that publishing of all verified purchase reviews, even if negative, should be made mandatory for eCommerce sites. They also mentioned that PR companies found to be in the business of providing fake online reviews should be identified and penalized. Other suggestions included furnishing real first and last name of the reviewer should be made mandatory, eCommerce sites supporting the practice of fake reviews to be fined and a machinery to be created in the Department of Consumer Affairs, Government of India to keep close watch over the activities of the eCommerce companies as it relates to ratings and reviews.